I am still on yesterday’s theme of lifelong and lifewide learning. Today I share a tweet that highlights a possible difference in employer and employee mindsets. Decision makers in human resources, particularly from the civil service, probably hire people on what they know. Why else would they so much on paper qualifications? These are a measure of what you know, not necessarily what you can do. Very few decision makers have figured out how to hire people based on their ability to learn. Here is a clue: A deep and diverse portfolio of evidence. Today I draw three lessons from a photo sharing incident that bugged me. I might have been a photographer in another life. Photography was a passion of mine as a teenager and I would save my allowance to buy rolls of film and to get them developed. I was even saving up to build my own darkroom to develop negatives. But that was long ago and a technology far, far away. The point is I was an amateur photographer. I even managed to sell a few photos when I was studying overseas. Now taking photos is an itch I scratch every time I travel. My favourite memories so far from #Georgetown #Penang. Full album at https://goo.gl/photos/5c7oLYdb1VpHaLuH8. Late last year I visited Georgetown, Penang, which is a city in UNESCO’s World Heritage List. I took lots of photos, and as I had just started using Instagram, shared a few on that platform. One photo that took a while for me to set up was this one. So imagine my dismay when I spotted this in a feed that was not mine. You can tell that it had been enhanced a little, probably with an Instagram edit. However, the positioning of the items, the stain near the teapot, and the imperfections on the tray show that the original photo was mine. I wrote to them to say that the photo looked familiar. This was their reply and my response. What are some lessons from this incident? I am all for open educational resources and I champion Creative Commons (CC) licensing. However, my photo was not shared under CC in Instagram. The hotel that used my photo did not 1) ask for permission, 2) receive my permission, and 3) acknowledge me. Kids need to be taught how to navigate traditional copyright and CC waters if they are not to make the same mistakes. Another lesson is the importance of putting your ideas online. While this gives others the opportunity to borrow or steal, the pros of increased reach and feedback far outweigh the cons. Putting them online with date and time-stamping also allows you to say who was first. Yet another lesson is monitoring your portfolio of work. In this case, I had simply followed that hotel on Instagram. The same principle and strategy applies in professional work. If you are part of a community of workers or interest partners, you know who is who and who is doing what. You cannot say you are part of a community and not know what is going on. You should know or someone will let you know. My meeting today reminded me of the importance of maintaining a living e-portfolio. Clients found me via my YouTube vids & blog. I started my journey as an independent education and technology consultant a year ago. Since then, my blog, Twitter feed, YouTube videos, and other online artefacts have been key to making new connections for me. 3) It is a way for people to contact me. I maintain my blog as the main component of a living e-portfolio. It is living because I blog daily and edit other pages regularly. One result of doing this is being listed at or near the top of Google searches on topics that matter to potential clients. The best thing about maintaining a living e-portfolio is how I do not need to make claims or prove my worth. My work is an open book and visitors can decide if they like what they see and wish to see more in person. Maintaining a living e-portfolio takes work. But I have found that the process of discipline has become a pleasurable one. 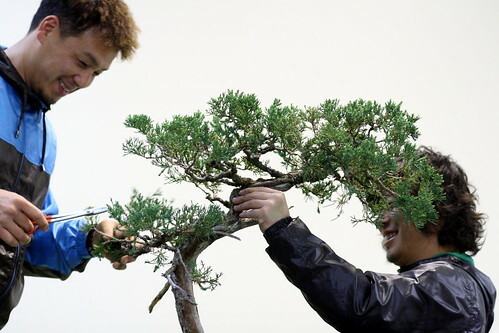 This might be like getting the satisfaction of trimming a bonsai tree. It takes effort and patience, and the results are not always obvious. But over time I learn from the process about the process. You can read all you want about e-portfolios and how they are important for study and for work. But I offer a visual and aural treat instead. This was a video by Richard Dunn who was stranded in an airport last year. Instead of complaining, he decided to use the time to create a video while lip-syncing All By Myself. The final product was laugh-out-loud hilarious and completed with just an iPhone. Dunn also shared his process, warts and all, in the video below. 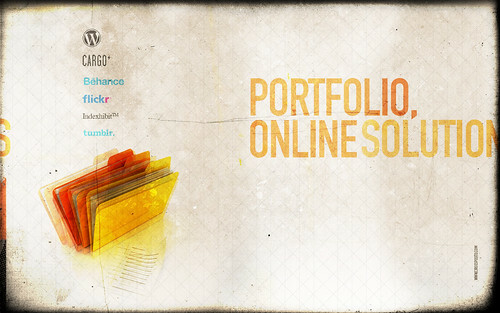 Portfolios of work should also be open for critique. Dunn was not outdone when asked to defend his claim that he did all the work himself. As a bonus, he got to meet Celine Dion herself. Very few of us are going to meet a celebrity as a result of sharing portfolio artefacts online. But all of us should not just share the products. We should also provide insights to the processes behind the products and be open to the scrutiny that follows. One of my newfound favourites on YouTube is Brett Domino. He and his partner form the Brett Domino Trio band (and yes, there are only two of them). BD appeared on my radar thanks to a Gizmodo post a short while ago. He spoof-taught us how to create a hit pop song. The video went viral, but I do not think that his channel has got as many new subscribers as he deserves. I think that he is a rare combination of musical and comedic talent. But not everyone agrees. When the BD Trio appeared on Britain’s Got Talent five years ago, Simon Cowell did not appreciate his talent and was the first (and only) judge to buzz them out. He did not get what BD was trying to do. The audience seemed to get it. The other judges did and even had to explain it to Cowell. There are many Cowells in the world today. They have narrow definitions of talent or worth. When they are the majority they drown out the views of the minority who think otherwise. Even if they are the minority, they have so much influence, possess veto powers, or claim to represent current norms that they get their way. Take BD’s video response to Airbnb’s recently redesigned logo for example (warning: Not for the prude or sensitive). BD was not the first to point of that the logo looked like genitalia. However, I think he quickly responded with a funny and catchy song. But how many people are going to laugh along and appreciate his talent? Here is another example. Someone I know on Twitter expressed her frustration at having to show her O and A-level certificates as she moved to another job in the civil service. Most statutory boards and the civil service here prize paper qualifications seemingly at the exclusion of everything else. Almost two decades of teaching experience was not good enough. That person was facing a Cowell form of evaluation. But I think that it is far more important to know what you are worth by your own reckoning, and if you find it necessary, find other measures. The BD Trio has its likes and comments in YouTube. Owners of other forms of digital portfolios can collect and curate comments, critiques, and bouquets, and showcase them alongside processes and products of learning. I think these will be far more important and effective in the near future. I have found this to be true for myself. I am leaving NIE at the end of the month. But I have found suitors despite not actively looking for a more permanent job. People know me from what I have shared at talks or online. My worth is not measured by my doctorate but by what value I bring to the table. That value is not theoretical in the form of school certificates but a living portfolio in the form of this blog and other digital artefacts. So instead of waiting for the world to change, I suggest we see and be the change. We all have talent whether someone else values them or not. I read Reviewers Unhappy with Portfolio ‘Stuff’ Demand Evidence and shook my head. It wasn’t that I did not agree that portfolios are often loose collections of artefacts instead of clearly articulated evidence of learning. I definitely agree with the sentiment that “collecting is easy. Interpreting and integrating the collection is hard”. Therein lies one major issue. I think instructors and learners expect too much of an e-portfolio. The technology behind the portfolio make the assemblage easy, especially if the platform is a highly controlled LMS. But such a system interferes with the interpreting and integrating because it is hard for the user of the e-portfolio to feel as if he or she owns it. If you don’t own it, you don’t identify with it or invest in it. E-portfolios are a sociotechnical system. The technology makes the collection, reflection, selection and presentation efficient. It is the social component that makes it effective. Some social components could include a constant negotiation for what goes into a portfolio, for conversations to take place between instructors of different courses of the purpose and outcomes of a portfolio, and trying to replicate quality interactions that already take place in the blogosphere, Facebook and Twitter. The photo is from Fisherman’s Wharf in San Francisco. 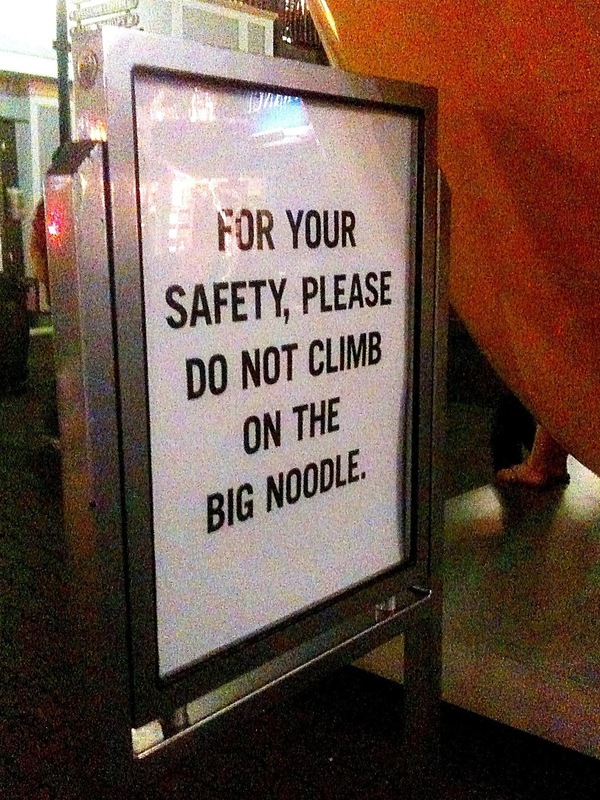 It’s a warning sign not to mess about with what looked like a giant macaroni piece. Believe it or not, it has got something to do with what I have learnt so far on our study trip. I wrote much of this entry as we were driving from Santa Barbara to Gilroy enroute to San Jose. It’s the only time I was able to actually sit down to process the wonderful things I have learnt so far from the equally wonderful people of the Graduate College of Education at UC Santa Barbara. I have to take back what I said about what we might learn after spending all this money to travel here. Like the sign in the photo, there some things you just have to see for yourself in their proper context to get a more accurate understanding. If our teacher preparation programme is like a factory that churns out over 2000 teachers a year, the teacher education program is a boutique that carefully nurtures about 100 teachers a year. UCSB only offers a Masters in Education and student teachers have a year to complete this course. They typically teach in schools in the day and have classes in the afternoon and evening. I think there is no better way to embed theory in practice. Sounds intense? There’s more. As student teachers do this, they maintain two types of portfolios. The first is a credential portfolio which documents their practicum. The second is an M Ed portfolio that is a form of action research and links their coursework to their practicum. It’s difficult to describe briefly, but the quantity and quality of the work these teachers-to-be generate is immense! Student teachers are required to defend their portfolios and we were privileged to observe and participate in examples of both portfolios. What impressed all of us was the ability of the student teachers to not only clearly articulate their ideas and the issues they were facing, but also critically evaluate them in ways that clearly linked theory with practice. They can do this because they are constantly exposed to a working philosophy of inquiry and argumentation in their programme. For example, if a student wants to know how to engage learners, they are not necessarily told directly how to do this. Instead, they explore their own understanding of what it means and build on it (or break it down) by tapping relevant sources of information. They hone their understanding by debating their findings with other. These are key to creating a thinking teacher. But the folks at UCSB readily admit that what they do is manually intensive in terms of instruction, mentoring and evaluation. They use very little current technology to add value to what they do or to enable them to do what they otherwise couldn’t do. They could, for example, use e-portfolios to more easily enable the tracking of the history of learning artefacts. This in turn could allow student teachers to identify their “aha” moments. They could use the same to document the comments and critiques of student teachers, their peers and their mentors. This would serve as a recording, referencing and reflecting platform. I think that we in NIE are well-placed to implement e-portfolios in powerful and meaningful ways. I can only hope that we explore progressive routes to doing this rather than try to replicate what no tech or old tech already do.